Microsoft Outlook is a great email client application and it has 400 million active users across the globe. It allows professionals and consumers to send and receive important information through emails. Accidentally deleting these Outlook emails can land you in a big trouble. Fortunately, you can always recover deleted Outlook emails with Scanpst.exe (inbuilt tool). However, the situation gets quite complicated if you have permanently deleted Outlook emails. In this case, Outlook email recovery using Scanpst is not possible. So, in this DIY guide, you will learn how to recover deleted Outlook emails even after permanent deletion (hard delete). Remo Repair Outlook PST is widely preferred and highly downloaded application that can recover permamnetly deleted Outlook emails in just three clicks. Try the free trial now!! When you accidentally or intentionally delete an email from Microsoft Outlook, the deleted message will not be immediately removed from the mailbox. Instead, it goes to Deleted Item/Trash folder (depending upon the type of email account you are using). So, recovering deleted Outlook emails is still possible. How to Recover Deleted Outlook Emails? Step 1: Open Outlook and select Deleted Items/Trash folder from the left pane. Step 2: Select the deleted email that you want to recover and click the Restore button. Else, right-click on the deleted email. Click Move, then select destination folder to restore the deleted Outlook email. Your deleted Outlook email is restored successfully in the original folder from where you erased it (or to a specified folder). What If the Deleted Email Is Not Available in Deleted Items Folder? Note that the above method cannot restore permanently deleted emails i.e. deleted Outlook emails that have been removed from the Outlook Deleted Items folder. How to Recover Permanently Deleted Outlook Emails? In some cases, you can even recover deleted Outlook emails after the Deleted Items folder is emptied, or the email is permanently deleted. So, when you can’t find a deleted email in the Deleted Items folder, follow the below procedure to restore your lost Outlook emails. Note: If Recover Deleted Items from Server option isn’t available, your account doesn’t support recovering deleted Outlook email that’s no longer present in Deleted Items folder. Where Will Be Deleted Emails Restored? The deleted Outlook emails you recovered this way, will be restored to their respective source folders (if possible). If the original folder is no longer present, then deleted emails will be placed back to your Outlook Inbox. In some Outlook profiles, emails recovered from the Recover Deleted Items folder will be moved to Deleted Items. From there you can Move or Restore emails to your specified mailbox folder. If you don’t see Deleted Items folder i.e. your profile has a Trash folder, instead of Deleted Items then, your account doesn’t support recovering permanently deleted Outlook emails. Email messages removed from the Deleted Items folder are recoverable for 30 days (It may vary depending on your server configuration. Generally, it may be 7 to 14 days). So, after this period you can’t retrieve deleted Outlook emails using Recover Deleted Items option. Purging an email deletes it permanently, and no traditional way of Outlook email recovery can help you in recovering it back. If you’ve lost or deleted an important Outlook email accidentally, and you can’t recover it using Microsoft Outlook Recover Deleted Items folder, then do nothing else! 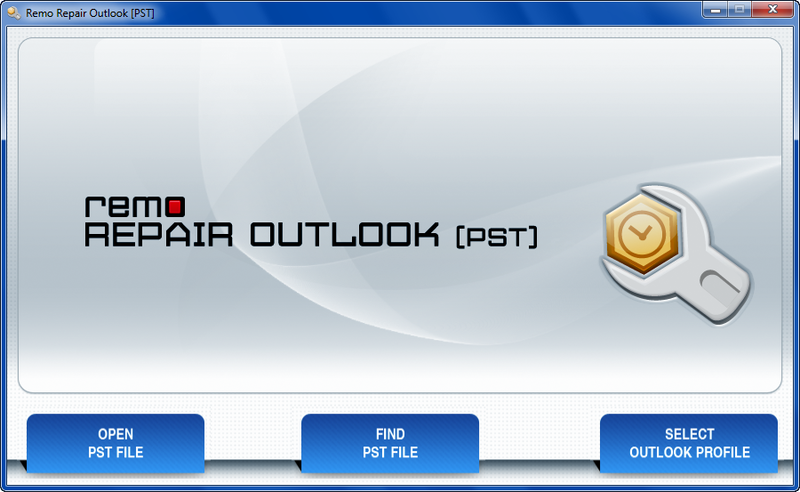 Directly download Remo Repair Outlook (PST). You need an ideal Outlook email recovery tool to restore shift deleted, permanently deleted or lost emails from Outlook when manual methods fail. Remo Repair Outlook (PST) is one such reliable software capable of retrieving deleted/lost Outlook emails without affecting your PST file. This software is developed using advanced algorithms hence it helps you in easily recovering deleted emails even from crashed, damaged, and corrupt PST files. It not only helps you to retrieve deleted Outlook emails but also the other deleted or lost Outlook items like Contacts, Journals, Attachments, Notes, Tasks, Calendar Entries, Personal Folders, etc. This Outlook repair tool ensures the safety of your Outlook data file, as it doesn’t work on your original PST file. The program creates a copy and then repairs Outlook data file to give you a new healthy PST file with all your restored emails, contacts, and more items. So, try the cost-free edition of this Outlook email recovery toolkit and undelete Outlook emails in just a few clicks. Step 2: Select Normal Scan and location to save repaired PST file. Click the Repair button. After the tool completes the PST file repair process, you can view the repaired PST file along with recovered Outlook emails. If you are satisfied with the Outlook email recovery results, save the PST file and configure it with your Outlook account. Supported Microsoft Outlook Versions: Outlook 2016, Outlook 2013, Outlook 2010, Outlook 2007, Outlook 2003, and Outlook 2000. Supported Microsoft Windows OS: Windows 10, 8.1, 8, 7, Vista, XP, Server 2003 and Server 2008. MS Outlook may empty the Deleted Items folder every time you exit Outlook program. This lessens the Outlook email recovery possibilities. So, disable this option by navigating to File -> Options -> Advanced. And, uncheck “Empty Deleted Items folder when exiting Outlook” checkbox under Outlook start and exit. Double-check before you empty the Trash/Deleted Items folder or while permanently deleting an email from Outlook. An updated backup of your PST file might help you at several unforeseen situations like restoring your deleted emails and other data. So, it is highly recommended to have a regular backup of your PST file on a safe storage drive.